'Law Books in Action: Essays on the Anglo-American Legal Treatise' explores the history of the legal treatise in the common law world. 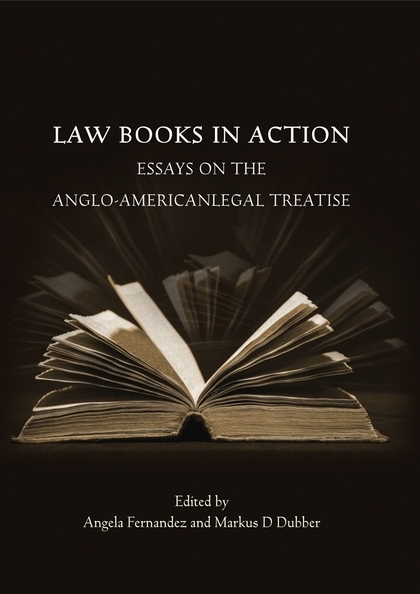 Rather than looking at treatises as shortcuts from 'law in books' to 'law in action', the essays in this collection ask what treatises can tell us about what troubled legal professionals at a given time, what motivated them to write what they did, and what they hoped to achieve. This book, then, is the first study of the legal treatise as a 'law book in action', an active text produced by individuals with ideas about what they wanted the law to be, not a mere stepping-stone to codes and other forms of legal writing, but a multifaceted genre of legal literature in its own right, practical and fanciful, dogmatic and ornamental in turn. This book will be of interest to legal scholars, lawyers and judges, as well as to anyone else with a scholarly interest in law in general, and legal history in particular. Angela Fernandez is professor at the University of Toronto, Faculty of Law. Markus D Dubber is professor at the University of Toronto, Faculty of Law.